Noob question here: I got this radio working, but it doesn't have an antenna. What should I use, and how do I hook it up? There are 3 screws on the back labeled A, Z, and G.
Depends where you are. I have a couple strong stations broadcast from antennas less than 10 miles from my house. One is barely a mile away. Some of my radios don't even need an antenna. Or just touching the A terminal with a finger is sufficient. The ones that do need an antenna, 10 feet of wire on the A terminal or a simple rabbit-ear antenna from an old TV are usually enough to pull in a half dozen strong local stations. Out in a rural area, you might need a long-wire antenna (30 to 200 feet) mounted as high in the air as possible to pull in any stations, and even then you may only get a half dozen. 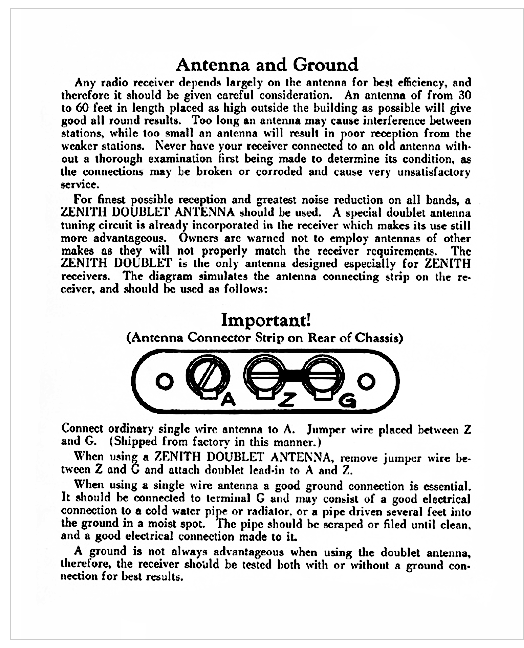 In any case, A is the connection for a single-wire antenna. G is the connection for Ground, like the center tap on an electric outlet, or a water pipe. Z is the connection for the second wire of a dipole antenna. Any time you're not using a full 3-wire setup, connect the Z terminal to the G terminal with a short piece of wire. My recommendation, start by connecting 10 feet of wire to the A terminal. If the results are not good, then try connecting a decent ground to G and see if that improves things. Tell us how that works, and whether you think you need more. The 10 foot wire works, but I only get one station well. I guess there are too many mountains around here. Grounding it to a pipe didn't seem to make any difference. I guess the next step would be an outdoor antenna. Just wanted to update this. On a whim, I tried connecting the coax cable from my old satellite dish on my roof. Then I ran a wire from the ground connection to a water pipe under the house. Works great! I'm sure the dish itself isn't doing anything, but since the wire runs up to the roof, it is pulling in stations. I can tune in at least 20 AM stations now. It's interesting that the presets, which are tuned with a screw, come in louder than tuning the same station with the main dial.